This article is about the Nickelodeon TV series. For the Carly Rae Jepsen song, see All That (song). All That is an American sketch comedy television series created by Brian Robbins and Mike Tollin. The series originally aired on Nickelodeon from April 16, 1994 to October 22, 2005, lasting ten seasons, and was produced by Tollin/Robbins Productions (later Schneider's Bakery during the final season). The pilot episode was originally shown as a special "sneak peek", with the show officially debuting a regular series on December 24, 1994. The series features original short comedic sketches and weekly musical guests aimed toward a young audience. Its sketches parody contemporary culture and are performed by a large and varying cast of child and teen actors. Early episodes were taped at Nickelodeon Studios at Universal Orlando Resort, but then moved to Hollywood at the Nickelodeon on Sunset theatre (formerly the Earl Carrol Theatre), where other Nickelodeon shows such as The Amanda Show, Kenan & Kel, and Drake & Josh were filmed. In 2000, after six seasons, the show was put on hiatus and retooled; it was relaunched in early 2002 with a completely new cast. Four more seasons were produced before the show was ultimately cancelled. On April 23, 2005, Nickelodeon celebrated the tenth anniversary of All That. The special reunited cast members from both the original and relaunch eras of the show and several other special guest stars in a one-hour event. All That went on to become a fixture on Nickelodeon for over a decade, and has received acclaim for its diverse cast and impact on children's television. The series has spun off several members of the cast in their own Nickelodeon television series with varying levels of success. It has been marketed in other ways, including an audio recording, books, a feature film, festival tour, and numerous reunions and specials celebrating the legacy of All That. In 2019, Robbins, the current president of Nickelodeon, announced a revival of the series with original cast member Kenan Thompson serving as executive producer, with Kel Mitchell later confirmed in the same role. Brian Robbins and Mike Tollin created the show, and the head writer was Dan Schneider who also became the showrunner of the series in the third season. All That marked the beginning of Schneider's prolific career in creating and writing hit television series for young audiences. The New York Times, in separate articles, referred to Dan Schneider as "the Norman Lear of children's television" and "the master of a television genre". In 1986, Robbins and Schneider met while working on the ABC sitcom, Head of the Class. Becoming close friends, the two performers both shared a mutual interest in writing, eventually coming together to write and then pitch an episode to the show's producers just to see if they could do it. To their amazement the producers liked their idea and bought it. Their episode: Will the Real Arvid Engen Please Stand Up later aired during the show's second season. Exterior of the former Nickelodeon Studios where All That was filmed for its first two seasons. Following the success of Head of the Class, Robbins and Schneider were asked to co-host the second annual Kids Choice Awards in 1988 alongside Tony Danza and Debbie Gibson. Although unaware of the fledgling Nickelodeon cable channel before the invitation to host was brought to them, the two agreed. The award ceremony that year was produced by Albie Hecht, with whom Robbins and Schneider quickly struck up a friendship behind the scenes. Their friendship continued after the awards and Hecht suggested they develop something for Nickelodeon. Robbins and Schneider later declined his offer as they were still under contract with ABC, at the time. In 1991, Head of the Class ended its run and Robbins started a production company with producer friend Tollin, aptly named Tollin/Robbins Productions. The company originally produced several small budget sport documentaries. Hecht, now Head of Development for Nickelodeon, contacted them and asked them to film a project for the network. The half-hour documentary they made featured the network's game show hosts Phil Moore (Nick Arcade) and Mike O'Malley (Get the Picture and Nickelodeon GUTS) as co-hosts of a comedy tour as they drove around to different cities to perform. Since their schedule only permitted for two days of filming, Tollin/Robbins had to make the entire show appear as if they had toured around the country. Impressed with the final product, Hecht met with Robbins to discuss developing a new show for the network in 1993. Asking Robbins if there was any type of show that he would be interested in making, he responded with the idea of creating a kid-version of Saturday Night Live. Bringing in Schneider (as head writer) and Tollin to help develop the show, the three were influenced by classic sketch shows such as The Carol Burnett Show, You Can't Do That on Television and Laugh In, and began to flesh out a rough idea of the show's format. Once greenlit, Robbins, Schneider and Tollin decided against writing the Pilot episode and instead chose to compile the cast first. Usually in television (as Schneider explains) the Pilot is written first and the cast is assembled later. However, the three believed it was crucial to find the right child actors first and then tailor to their strengths. With Hecht's blessing, a nationwide talent search for child and teen actors was launched that would last for several months. Eventually Angelique Bates, Lori Beth Denberg, Katrina Johnson, Kel Mitchell, Alisa Reyes, Josh Server, and Kenan Thompson were hired. When I first got involved, it was kind of funny. My mom had me in a talent show, I was one of the winners. [An agent] had his friend there, who was the one that got me on [All That]. ... The process itself was, oh my gosh. We did 10 auditions. I thought I didn't have it. They had us doing improv, sketches, all kinds of stuff. I went in fully dressed as Urkel. I was doing character voices. I had the glasses, I had the suspenders, everything. You name it, I had it. I got called a couple months later like, "Oh, you know you got it." It was crazy because it was a nationwide [search]. The reason I got the audition was 'cause I was in a drama competition for high school and my scene placed first in competition. So there's lots of different categories and all the first-place teams in all the categories had a showcase at Paramount Studios at like this little theater. And some of the producers for All That were there. So after that a few of us from the competition got called in to audition. So I just went on it like a total lark, not like it was some big deal. Just kind of a goof. And that was my first audition for All That. I wasn't nervous 'cause I wasn't really taking it seriously. But that, in hindsight, served me really well. I had one callback, which was a little more interesting. I mean, I had the feeling when I went back for the callback that I was gonna be cast. I can't necessarily explain it, but I just had this feeling like I'm gonna do this show. Which was really strange because I'd never done a show before. So I just went, I did the material, I met some more of the people and then I left. And I had this feeling about it. Mine was a casting call, but it was set up through my agent and I had to go back in like five times. And each time, I would get paired up with other random people to do sketch comedy but it was very off-the-cuff, like no script or plan or anything. It was like, you're miners, mining for gold in Sicily, and we'd have to figure it out. But that happened to be my favorite sort of thing that I'd always loved best...I had no idea what I was in for, but I knew it was going to be the ride of my life. I knew it was going to be fun. I never wanted anything as much before. This one felt like home, this one felt like me and I felt very excited. But no, I don't think we had any idea what we were in for. They did a nationwide search, and I remember that day, I had midterms at school, but I also had to learn my monologue because I had the audition later that day. I remember Brian Robbins was there and a few of the other producers. I came in and I totally forgot my monologue, because I had been studying for midterms and I never do that. As I was walking out, I tripped over some cords and knocked over some cameras and all this stuff. And I played it off like it was funny and they started just cracking up, laughing. I came back in, knocked the monologue out and then they were, like, hey, man, you know, you're really funny. Do you do any impersonations, as well? I just did, like, my uncles and, you know, people that I knew in Chicago, old man voices and I even did the [Good Burger] Ed voice for the first time there. In my audition, I had to do a stand-up comedy act in conjunction with an audition scene and so I just remember in the monologue I wrote about, like, my sister having long hair in her underarms and we were eating breakfast. [Laughs] The hair would get into my pancake syrup. I just was being cheesy and crazy. And when I went in there, it was funny because I just felt like it was all very natural. It was all very organic. I was in the right place at the right time and they got me. I was blessed enough that Brian Robbins and Dan Schneider and Michael Tollin, they totally got me but it literally took me seven auditions to get this gig. And this is probably the most auditions that I ever had to audition for before because, I mean, who auditions for something seven times?. I was one of the two kids chosen from Chicago. Me and Kel got picked from the Chicago group. I remember that it was more than one audition. I think it was probably close to two to three, maybe even four. They brought us in quite a bit. They wanted us to do some of our characters and then some impressions. I remember originally meeting the casting people and then, you know, Brian and Dan and the producers of the show being in those auditions and going in and doing my sketch characters. And it was a lot of fun. Anytime you get to do those types of auditions, it's pretty cool because it's your stuff, you know, and when you're a kid, that's pretty rare. [I was introduced] to Brian and Michael Tollin. I was the last to be chosen [for the show]. [There weren't a lot of auditions.] I just did the one and they told me whether or not I had it. I went into the office and did impressions and stuff. The first Mighty Ducks, that was my first movie. Once I got into real movies, then started the commercials, [then TV]. With the cast intact, writing for the Pilot began. Cast and crew flew out to Nickelodeon Studios at Universal Orlando to begin production of the episode. And on January 17, 1994 the Pilot episode was set to begin filming. Tollin recalls debating with Robbins over whether or not to postpone filming because of the Northridge earthquake that occurred hours earlier on that same day. "The morning was spent figuring out how bad was the damage both physical and psychological. Should we postpone [the pilot shoot?]. I was trying to do the right thing. [My wife] was trying to do the right thing. Aftershocks ensued. She said, "I can't believe you didn't come home." The show went on. After filming was completed, the Pilot sat on the shelf for several months as the screenings did not test well with the focus groups,  consisting of children, both boys and girls in different age groups, that Nickelodeon used. The scores showed that Kids probably wouldn't like this new sketch comedy show for kids. Regardless of the negative response, Geraldine Laybourne (the then President of Nickelodeon) decided to pick up the show for a full first season. Nickelodeon on Sunset at 6230 Sunset Boulevard as seen in May 2011. All That was filmed here until its cancellation. The basic concept they came up with was to produce a half-hour show that featured a cold open (which featured the cast participating in varying juvenile acts in a green room before the show starts), several different sketch-comedy pieces and then a musical performance to close out the episode (this format would remain the same for all ten seasons). The main staple, of the original seasons, was the Vital Information sketch which was featured in every episode until the relaunch in 2002. During Season 1, Kevin Kopelow and Heath Seifert were brought on as producers and continued working in that capacity through Season 3. The writing team advanced to Executive Producers/Head Writers for Seasons 4–6. Kopelow and Seifert continued their relationship with Kenan Thompson and Kel Mitchell by co-executive producing and head writing Kenan & Kel and eventually writing the feature film Good Burger (1997) with Schneider. After Season 2 ended in 1996, the show moved out of the old Nickelodeon Studios at Universal Orlando Resort in Florida and into the Nickelodeon on Sunset (formerly The Earl Carrol Theater) in Hollywood where it would remain for the rest of the show's run. Over the next few years, as the show grew in popularity, several departures and additions occurred. Some of these additions to the cast included Amanda Bynes, Nick Cannon, Gabriel Iglesias and The Adventures of Pete & Pete star Danny Tamberelli among others. In 2000, Nickelodeon placed the show into hiatus to be retooled. Production started back up a year later after an extensive nationwide talent search for child and teen actors. Ultimately hired were Chelsea Brummet, Jack DeSena, Lisa Foiles, Bryan Hearne, Shane Lyons, Giovonnie Samuels, and Kyle Sullivan. The first episode of the "new" All That featured special guests Frankie Muniz and Aaron Carter and debuted on January 19, 2002. Foiles announced the show's cancellation in September 2005 via her fan club. However, after Robbins became president of Nickelodeon, he expressed interest in rebooting the series in November 2018. The show's second revival was announced on February 14, 2019. All That features original short comedic sketches that parody contemporary culture. Although the show had a team of writers, the cast were encouraged to help contribute their own ideas for characters and other segments. Improv and ad-libbing were used to help the cast and writers find the right tone for a certain skit. The following is a short list of some notable sketches that aired during the show's tenure. Ask Ashley starring Amanda Bynes as a little girl named Ashley, who offered advice from her bedroom on a TV series. She was sweet and friendly until she reads letters sent in by clueless viewers. After reading a letter, Ashley would go on a violent tirade against the letter's author. Baggin' Saggin' Barry starring Kenan Thompson as a cool dude with baggy pants. Once pulled Abraham Lincoln from his pants. Detective Dan starring Josh Server as a hopelessly incompetent private investigator who frequently stumbled into a crime scene to make matters worse. Everyday French with Pierre Escargot, featured Kenan Thompson, sitting in a bathtub filled with suds, wearing a rain coat and matching hat and swimfins on his feet. In the sketch, he would say silly phrases in poorly-pronounced French and translate them in English. Know Your Stars a recurring sketch that involved a random voice that made an impersonation of an individual with embarrassing, wacky, funny and untrue facts and info about a cast member or special guest. Good Burger is a recurring sketch that took place at a fast food restaurant. The cashier, Ed (played by Kel Mitchell in Seasons 1–5 and Ryan Coleman in Season 9), was portrayed as a clueless teenager who always found a way to mess things up. A notable quote from Good Burger, stated by Ed in every sketch, was "Welcome to Good Burger, home of the good burger, can I take your order?" Good Burger was later made into a feature film. The Loud Librarian starring Lori Beth Denberg, as a librarian who would coincidentally yell out, "Quiet, this is a libary! [sic]" along with a variety of noisemakers whenever the silence in her library was accidentally violated. Sugar and Coffee starring Lisa Foiles and Kyle Sullivan as extremely hyperactive hosts of their own talk show. The pair would eat pure sugar and drink massive amounts of coffee and then force their guests to do the same thing from giant orbs attached to the ceiling, which usually led to overactivity in the worst way. Thelma Stump starring Jamie Lynn Spears as an extremely old woman who serves as a bodyguard and security guard for the backstage of All That. Vital Information is a recurring sketch that was the center piece of the show before the relaunch. Starring Denberg (for the first four seasons), Danny Tamberelli (for seasons five and six), and Lil' JJ (in the tenth season) deadpanned one liners, usually three in a row. Miss Piddlin starring Kenan Thompson as the lunch lady at the school. The only thing she offers is peas. She gets extremely angry when someone or people reject her peas. On March 13, 1999, All That celebrated its star-studded "100th episode" during the fifth season, although it was actually the 85th episode to be produced. This one-hour special was one of the only episodes (other than the 10th anniversary) in the show's history produced live. The actual 100th episode occurred with the fifth episode of Season 6, with Hoku as the musical guest. The Season 5 cast included, in alphabetical order: Amanda Bynes, Leon Frierson, Christy Knowings, Kel Mitchell, Josh Server, Danny Tamberelli, and Kenan Thompson with featured members Nick Cannon and Mark Saul. The 100th episode featured several celebrities: Melissa Joan Hart (Sabrina the Teenage Witch and Nickelodeon's Clarissa Explains It All), Larisa Oleynik (Nickelodeon's The Secret World of Alex Mack), Robert Ri'chard (Nickelodeon's Cousin Skeeter), and Britney Spears (in a taped video appearance; Spears was originally supposed to perform in person but had to back out due to a knee injury; Lauryn Hill took her place) all made appearances. Former cast member Lori Beth Denberg, wearing her traditional "Vital Information" outfit, made her final All That appearance (she was one of the few alumni who did not return for the 10th Anniversary special) to do the "Vital Information" sketch (Danny Tamberelli had taken Denberg's spot by this time). Former cast members Angelique Bates, Katrina Johnson, and Alisa Reyes made brief appearances on the red carpet. After the 100th episode, the show continued, winning the Kids Choice Award for Favorite TV Show on May 1, 1999. The special re-aired in April 2005 in honor of All That's 10th Anniversary, though Nickelodeon edited parts of the episode. Mýa Introduction: Mýa welcomes us to watching the live show, and Kevin loses his pants. Various stars are shown walking the red carpet, even the Big Ear of corn. Green Room: Everyone is nervous about the live show, including Kevin. But Danny is nowhere to be found! Good Burger: Ed keeps punching a customer (Josh) in the face when he keeps ordering a Good Punch. Meanwhile, Ed messes up Melissa Joan Hart's order and drives another customer (Mark) crazy. What-Everrrr meets Repairman: It's Jessica's birthday today, so Gina plans her surprise party on What-Everrrr! Gina receives Robert Ri'chard from Cousin Skeeter as a present (who ends up getting away). Jessica then breaks her nail, causing Repairman to fall into What-Everrrr. Repairman ends up breaking everything, including the camera, which rolls the clip of Ryan Heart the Dancing Monkey Boy. Mavis & Clavis introduce Musical Guest: Lauryn Hill - "Doo Wop (That Thing)"
Backstage Tour: Kenan and Josh give the audience and the viewers at home a backstage tour of the All That studio. They show the dressing rooms, the joke room, the prop room, and the All That Wall of Gifts. The dancing monkey boy clip is shown again. Vital Information: Danny still hasn't made it to the show yet, so Kevin asks the audience if any of them has experience in reading Vitals. Fortunately, Lori Beth Denberg was in the audience, but she refuses to do Vitals. This is the last time Lori Beth Denberg does the Vital Information sketch. Features Larisa Oleynik. Where's Danny: We now continue to see Danny's whereabouts. Fax Ashley: Since it is a live show, Ashley has a fax machine so she can receive live letters from viewers, but it turns out that all the letters from these people either have no exact idea of a live show. Inconvenience Store: Latanya and Lanisha criticize a customer's (Mark) bad breath when buying breathmints, and start hitting on a cute guy (Kel), which brings them to a fight. Danny is supposed to introduce the musical guest, but instead Josh introduces Musical Guest: Busta Rhymes - "Put Your Hands Where My Eyes Could See"
At the end, Danny finally arrives, but the show is already done. While not officially a part of the special, 7th Heaven star Stephen Collins can be seen as an audience member. in 2003, Nickelodeon advertised a competition called "R U All That? : Nickelodeon's Search for the Funniest Kid in America". It was a nationwide search to find a new cast member. The contest picked five finalists, and all of them performed a sketch with some of the cast members. The winner was Christina Kirkman who joined the show in the ninth season opener. In 2005, Nickelodeon celebrated the 10th anniversary of All That by airing episodes from the first six seasons in the week leading up to a "reunion special" hosted by Frankie Muniz on April 23. Ashanti and Bow Wow were the musical guests. Chelsea Brummet, Nick Cannon, Ryan Coleman, Jack DeSena, Lisa Foiles, Leon Frierson, Katrina Johnson, Christina Kirkman, Christy Knowings, Kel Mitchell, Alisa Reyes, Giovonnie Samuels, Mark Saul, Amanda Bynes, Josh Server, Jamie Lynn Spears, Kyle Sullivan, Danny Tamberelli, and Kenan Thompson, along with new cast members Kianna Underwood, and Denzel Whitaker, reunited on the show. Approximately 6.2 million total viewers watched the special on both its April 23 and 24 airings, making it the top cable or broadcast program for the 2–11, 6–11, and 9–14 age demographics, and TV.com gave it a rating of 8.7/10. After a four season hiatus, All That decided to bring back the "Vital Information" segment with BET's Coming to the Stage winner Lil' JJ succeeding Lori Beth Denberg and Danny Tamberelli, respectively. Lil' JJ's very first "Vital Information" occurred during the 10th Anniversary Reunion Special. All That is highly regarded for its large diverse cast both in terms of ethnicity and gender. The show was praised in The Atlantic for breaking the classical norms set in children's TV with its cast, irreverent and unapologetic humor, and kid characters played by actual kids. I was the first black female they had on that show...there weren't that many black shows on or black actors. When I left, it opened it up more for black female comedians. I've had people come back and tell me it felt like I passed the torch because they were all on TV watching like, "I want to do that, I want to do that," but then when they saw me, they thought, "Oh, I can actually do that." Black girls were coming up to me, parents are just like, "Thank you so much for what you've done." I was like wow. It feels surreal. I thought it was awesome because none of us look like each other. We were like a total melting pot of diversity...You have African-American, you have me[Hispanic], you have Caucasian... So there are kids that were able to sit home and go, I look like her, I look like him, I can relate. That was really important for me to be a part of a cast that was filled of diversity 'cause there's nothing more boring than a Brady Bunch concept. So at the end of the day, I was able to have the fans verbally tell me how they felt that All That impacted their lives and it made them come home and look forward to coming home and watching the show after school when they work on their homework, and how they loved to be able to have a little bit of music maybe their mom didn't let them necessarily listen to some of the music or whatever the case may be. In 2011, Lisa Foiles joined forces with Comikaze Expo, planning the first ever All That reunion with Comikaze Expo CEO Regina Carpinelli. The reunion featured a roundtable discussion, where the cast reflected on their tenure on the show and received questions from the audience. Angelique Bates, Lori Beth Denberg, Foiles, Leon Frierson, Katrina Johnson, Kevin Kopelow, Kel Mitchell, Alisa Reyes, Giovonnie Samuels, Mark Saul, Josh Server all participated in the event. Also in 2011, Bates, Johnson, and Reyes appeared together at Zooey Magazine's One Year Anniversary Special Event held in Hollywood. The anniversary launched the Love Is Louder campaign which speaks out against bullying and hate messages. In 2015, Mitchell and Thompson reunited on The Tonight Show Starring Jimmy Fallon where they performed a special Good Burger sketch. Dan Schneider returned to write the sketch for the show. In 2015, Comikaze Expo held the second All That reunion. Angelique Bates, Chelsea Brummet, Ryan Coleman, Lori Beth Denberg, Jack DeSena, Lisa Foiles, Bryan Hearne, Katrina Johnson, Christina Kirkman, Christy Knowings, Kel Mitchell, Alisa Reyes, Giovonnie Samuels, Mark Saul, Josh Server, and Danny Tamberelli all participated in the event. On April 22, 2016 Nickelodeon aired a reunion special consisting of new 3-4 minute shorts with most of the original cast, including Kenan and Kel. Kenan & Kel is an American teen comedy sitcom created by Kim Bass for Nickelodeon. It starred then-All That cast members Kenan Thompson and Kel Mitchell. Sixty-five episodes and a made-for-TV movie were produced over four seasons. 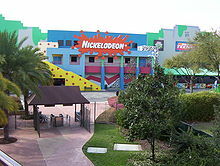 The first two seasons were filmed at Nickelodeon Studios in Orlando, Florida, and the remaining two were filmed at the Nick on Sunset theater in Hollywood. The Amanda Show is an American live action sketch comedy and variety show that aired on Nickelodeon from October 16, 1999 to September 21, 2002. It starred Amanda Bynes, Drake Bell, and Nancy Sullivan, along with several performing artists who came and left at different points. The premise of the semi-scripted show was that its star, Nick Cannon, a former cast member on All That, would come across a situation he thought needed changing and then "take over" to make things better, or at least funnier. Zoey 101 is an American television series which originally aired on Nickelodeon. It focuses on the lives of teenager Zoey Brooks (Jamie Lynn Spears) and her friends as they attend Pacific Coast Academy (PCA), a fictional boarding school in Southern California. It was created by Dan Schneider. Just Jordan, starring Lil' JJ, follows the exploits and actions of Jordan Lewis, who has moved to Los Angeles from Little Rock. All That made one effort in developing a popular sketch into a feature-length film with Good Burger. You get something like Good Burger and you just ride it, and all of a sudden there's something called Nickelodeon Movies, put under the banner of Paramount. It was a big synergy. We just took a shot. ... There was an unforgettable day when we went to Paramount with a script. The Paramount execs were interested enough to come to a table read. I don't believe any money had been spent. We realized this was a huge opportunity. Kenan and Kel came and we filled in with other actors. ... It was late January 1997, and he (John Goldwyn a senior executive at Paramount [came back and said], "The good news is we're going to make this movie; the bad news is it needs to be in theaters in July." The typical gestation period for movies is five to seven years. Brian signed up to direct and we shot the film locally, built Good Burger, brought in Sinbad, brought in Jenny, brought in the whole cast of characters. Twenty years later I got a call from my niece from Chicago who said, "I just watched the best movie." That thing worked. The movie was released into theaters on July 25, 1997 with a budget of roughly ten million dollars. Rotten Tomatoes gives the film a score of 33% based on reviews from 27 critics. Most praise came to Kel Mitchell and Kenan Thompson's performances. Although the film received mixed to negative reviews from critics, it received positive reviews from fans and it was a financial success. On November 26, 1996, Nickelodeon released All That on CD, titled: All That: The Album. It contains All That dialogues from the show, and songs sung by musical guests (i.e. Faith Evans, Coolio, Brandy, Naughty By Nature, etc.). All That's theme opening and outro theme were released on this CD. Music from the CD is mainly inspired from the show. On October 1, 1998, Nickelodeon released a 112-page book of All That called All That: Fresh out the Box by Steve Holland. The book contains information of the show's sketches, cast members and notable points of the show. It also contains different character information as well. On June 30, 2000, Nickelodeon gave All That a promotional summer tour titled All That Music and More Festival, which traveled all over the United States and was hosted by the cast of All That. The tour began after Season 6 and lasted until September 3, 2000. The tour mainly featured the cast members of All That and a musical guest. Many of the musical guests joined and performed during the tour. Also while the tour went on, the cast members did numerous live sketches. There was also a ticket contest the year before the festival began. On July 29, 2000, Nickelodeon broadcast the highlights and events that happened during the entire festival. On August 15, 2011, the iTunes Store released All That: Volume 1 with the first seven episodes from season two. On November 29, 2011, the iTunes Store released All That: Volume 2 with seven more episodes from season two. All That: Volume 3 was released in 2012 with seven episodes from season two. Just like The '90s Are All That airings, the musical guest performances are omitted and the end credits are re-done as generic white text on black. All That Volume 4, with episodes from the start of season 3, was released on iTunes August 13, 2012; however, episodes 40 and 43 are excluded for unknown reasons with episodes 45 and 46 included instead. On June 24, 2013, the iTunes Store released All That: Retro Essentials with four episodes from season two. The episodes are 217, 220, 228, 237. Episodes 217, 220 and 228 were re-released with the musical guest performances. Episode 237 has the musical guest edited out. All That ran on Nickelodeon from 1994 until 2005 (its entire original run). All That aired on Nick at Nite on Mondays to Thursdays at 8:00 pm from June 25, 2012, until July 12, 2012, alongside Kenan & Kel at 8:30 pm. The Nick at Nite airings, had the musical performances edited out. All That ran in reruns on The N (became TeenNick on September 28, 2009) from March 12, 2008, to September 15, 2008. All That once again aired on TeenNick from July 25, 2011, to December 27, 2012, as part of The '90s Are All That (a block that is named after the show before the programming block was rebranded as The Splat in 2015). The show returned to TeenNick on The '90s Are All That, from March 4, 2013, to June 1, 2014. The '90s Are All That airings, however, also have the musical guest performances removed, along with their introduction sketches, presumably for time and the high cost of obtaining music distribution rights. The block initially only aired episodes from seasons 2 and 3, later adding seasons 4 and 5 into the rotation. The reruns on TeenNick in 2008 however, aired the Season 3 through 5 uncut and retained the musical guest performances, with the exception of the K-Ci & JoJo episode. The final rotation of these reruns included Seasons 6 and 7. ^ "All That Original Air Date". TV.com. Retrieved August 9, 2006. ^ a b c d "All That 10th Anniversary Cast and Crew Info". Hollywood.com. August 28, 2005. Archived from the original on June 3, 2008. Retrieved August 28, 2008. ^ a b c d e f Flanagin, Jake (April 16, 2014). "The Quiet Radicalism of All That". The Atlantic. Washington DC: Emerson Collective. Retrieved March 13, 2015. ^ a b c d e f g h i j k l m n o p q r s "How 'All That' Became the 'SNL' for the Next Generation". myspace.com. Retrieved March 11, 2015. ^ a b Petski, Denise (February 14, 2019). "'SpongeBob' Spinoffs, 'All That' & 'Are You Smarter Than 5th Grader?' Revivals & More On Nickelodeon's 2019 Content Slate". Deadline. ^ Mitchell, Kel (February 21, 2019). "It's the truth!! #AllThat is back!! Get ready! Get Set! My bro @kenanthompson and I are about to take this to a whole new level! Now that's All That!". Twitter. ^ Steinberg, Jacques (September 7, 2007). "I, Little Sister, Becomes "iCarly"". The New York Times. New York City: New York Times Company. Archived from the original on April 16, 2009. Retrieved May 27, 2008. ^ Dee, Jonathan (April 8, 2007). "Tween on the Screen". The New York Times. New York City: New York Times Company. Retrieved May 27, 2008. ^ a b c d e f g h i j "All That's 20th Anniversary". blogspot.com. Retrieved March 11, 2015. ^ Werts, Diane; Granville, Kari; Kaufman, Bill (April 17, 1988). "SCREENING ROOM And Now For a Word From Our Sponsor". Newsday. p. 06. ^ McNary, Dave; Adalian, Josef (March 12, 2007). "Robbins, Tollin reduce joint projects". Variety. Los Angeles, California: Penske Media Corporation. Retrieved January 16, 2015. ^ "All That Oral History"
^ "Nickelodeon's longest-running live action series, All That, revs up for its seventh season with an all new format, including a weekly celebrity host and an all new kid cast". Viacom.com. Archived from the original on February 9, 2002. Retrieved December 20, 2006. ^ "Memo to Nickelodeon and the Writers of "All That"". Google Groups. Retrieved December 20, 2006. ^ "All That Season 7". TV.com. ^ "Jamie's On Air Dare". Youtube. August 19, 2008. ^ "Ned's Declassified on On Air Dare". youtube. August 19, 2008. ^ "2003, R U All That? 's winner". July 27, 2004. Archived from the original on November 3, 2008. ^ "Answer to your "All That" question..." groups.yahoo.com. September 5, 2005. Retrieved August 20, 2008. ^ "2018, Nickelodeon's New Chief Wants to Bring Back 'All That'". November 1, 2018. ^ Steinberg, Brian (February 14, 2019). "Nickelodeon Is Reviving 'All That' With Kenan Thompson as Executive Producer (EXCLUSIVE)". Variety. ^ a b "Ready Yet? Get Set: Behind the Scenes of "All That"". complex. Retrieved April 25, 2015. ^ a b "All That: 100th Episode - TV.com". TV.com. Retrieved 20 December 2006. ^ "1999 Kids Choice Awards IMDB". Retrieved 2007-08-11. ^ "Nick's All That 10th Anniversary Reunion Special is a Hit with Kids and Tweens" (Press release). Nickelodeon. April 26, 2005. Retrieved March 11, 2016 – via PR Newswire. ^ "All That 10 Anniversary Summary and Info on TV.com". TV.com. Retrieved March 11, 2016. ^ "Ready Yet? Get Set: Behind the Scenes of "All That"". complex. Retrieved March 14, 2015. ^ a b c "2004 Kids Choice Press Release". August 18, 2008. Archived from the original on July 16, 2008. Retrieved August 18, 2008. ^ Siryn (September 23, 2011). "Comikaze Expo Presents the Iconic Cast of "All That" In An Exclusive, First Ever Reunion!". Livejournal. Retrieved October 17, 2015. ^ "JOSH SERVER WILL JOIN COMIKAZE EXPO'S "ALL THAT" REUNION". joshserver.com. Archived from the original on November 18, 2015. Retrieved October 17, 2015. ^ "ZOOEY MAGAZINE – ONE YEAR ANNIVERSARY!". Zooey Magazine. October 7, 2011. Retrieved November 7, 2015. ^ "Alisa Reyes – Katrina Johnson & Angelique Bates from Nickelodeon's All That". ravepad. Retrieved November 7, 2015. ^ "BRITTANY SNOW: ALL IT TOOK WAS ONE VISION". Zooey Magazine. January 9, 2012. Retrieved November 7, 2015. ^ Jeffery, Morgan (September 30, 2011). "Kenan Thompson 'iParty' interview: 'I owe a lot to Nickelodeon'". Digitalspy. Retrieved October 17, 2015. ^ Jenkins, Nash (September 24, 2015). "Watch Kenan and Kel Reunite at Good Burger on The Tonight Show". Time. Retrieved October 18, 2015. ^ "Stan Lee's Comikaze 2015 Brings All That Reunion And More!". geeknewsnetwork. October 4, 2015. Retrieved April 20, 2016. ^ Dornbush, Jonathon (November 2, 2015). "See reunited All That casts sing the show's classic theme song together". Entertainment Weekly. Retrieved April 20, 2016. ^ Hinman, Catherine (August 17, 1996). "A 'Honeymooners' For Kids". The Orlando Sentinel. Retrieved July 25, 2011. ^ "Good Burger (1997)". Rotten Tomatoes. Retrieved April 1, 2011. ^ "All That CD Releases". Nickelodeon. February 26, 2007. ASIN B000002X1U. ^ "All That Book Releases". Nickelodeon. February 26, 2007. ISBN 0-671-01958-9. ^ "All That Tour Locations". findarticles.com. August 17, 2008. Archived from the original on March 28, 2006. Retrieved August 17, 2008. ^ "Music and More Highlights on Nickelodeon". TVguide.com. Retrieved November 17, 2008.